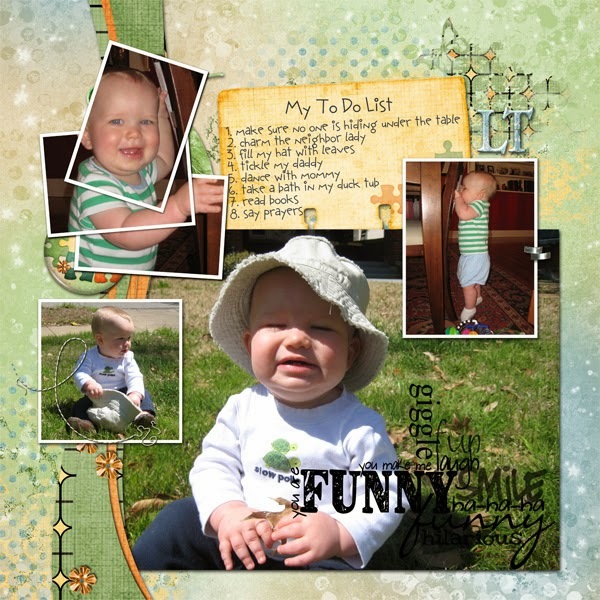 MyMemories Blog: Sunday Designer Challenge....brought to you by MariScrap & Kathryn Estry Designs! Sunday Designer Challenge....brought to you by MariScrap & Kathryn Estry Designs! Since becoming a grandmother of 5 precious babies, most of my pages feature one or more of my sweet little guys or girls. This page shows some of my favorite photos of my oldest grandson, Lincoln, when he was just a little guy. (His second name is Thomas, so I added LT just for fun.) Even little, every day was an adventure. I really like the photos of him looking through the chair slats and also putting leaves in his hat. On this layout, I positioned the photos so that they’re looking in. This isn’t necessary, but it does draw the eye into the page, so it’s a trick you might want to try. Journaling almost always adds to your page, and it can be as simple as Lincoln’s “to do” list. I chose my Terry Ridge Collection to make this layout as it’s one that you wouldn’t think would work for babies or little boys. I made it with grownups in mind, but to me, it’s fun to use a kit that doesn’t lend itself to the photos really easily. The green, blue, and tan in the kit do tie in with the photos though, while the puzzle pieces give it a playful touch. I like to bring an element or a look across a page or from one page to the next, and in this case, I used the same puzzle pieces that are in the big button and blended them into the note card. The big button peeks out just a bit from under the photos, and that’s okay. The border was an easy addition as my collection has a set of borders. You can use then on the side of a page or as I did here as an embellishment. The background paper is my favorite one in this kit. It was one I created with a lot of blended images and filters. It already had interest, but I added two of the overlay stamps from the collection to give it additional dimension. Also the stamp in the top right has the patchwork print that’s in the border, and the cutout butterfly works because of the outdoor photos. You’ll notice that I’ve tucked the large photo under the border and attached two others with a staple and stitching. My shadows are realistic and are adjusted to each photo or element. Overlay stamps get no shadow, stitches get just a tiny bit, and photos get a bit more, but they’re still not flying off the page. Keeping your shadows small and slight usually makes your page look more realistic. This isn’t the look for everyone, but I’m personally a realist when I scrap, and I like my digitally scrapped pages to look as if you could touch and feel the pieces. When I’m finished, I want them to look almost like traditionally scrapped layouts. Two things on this page that you wouldn’t see with traditional scrapbooking are the stacked photos in the upper left and the word art stamp. 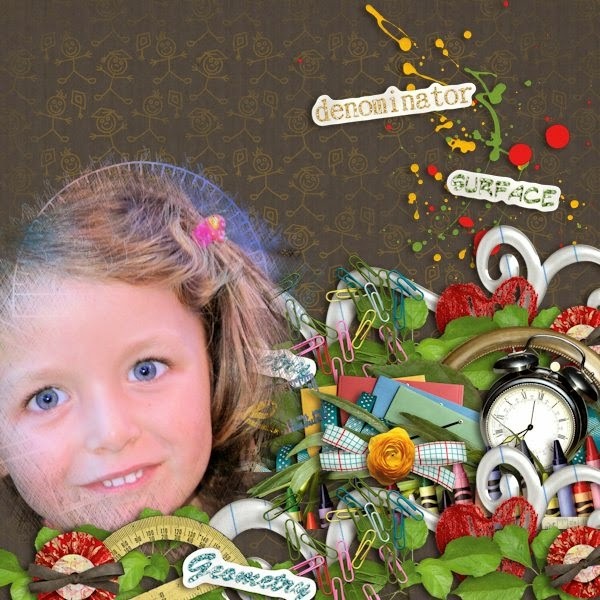 Isn’t digital scrapbooking awesome? The stacked photos are made using one of my Magic Stacks, and the word art is a cluster of different fonts and opacities. Lincoln definitely is funny and makes us smile! I hope you enjoy digital scrapbooking as much as I do and that you find something in my layout that you’d like to try. Thanks for looking! i will explain you a way of doing pages so so quickly and make some amazing composition. But first of all, let me explain why I did this last week. I'm a maths teacher and the "back to shcool" in France was the 2nd september. And guess what ??? In the night of the 1rst september, I get a really big gastro..yes yes, it's not a joke. So I can't take my students and was very in an hurry to do a lot of things. So in this case, I need a solution to get my new kit "Maths" ready and with adorable pages in short time. - select an adorable picture : i took my youngest daughter with her blue eyes clearly opened. hope you enjoy my quickly and simply recipe for a great composition.